Suggest that your daughter team a white long sleeve blouse with brown shorts for a trendy and easy going look. 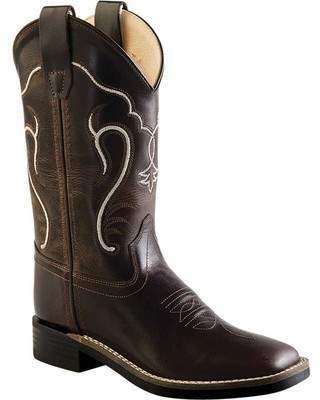 Old west ultra flex broad square toe boot youth are a good choice to finish off this getup. Suggest that your tot go for orange polka dot dress for a glam and trendy getup. Dark brown leather boots are a wonderful choice to round off this outfit. Suggest that your kid opt for a grey print long sleeve t-shirt and a grey tulle skirt for a cool, fashionable look. This ensemble is complemented well with old west ultra flex broad square toe boot youth from shoes.com. Dress your darling in a grey star print sweater and a grey skirt to create a smart casual look. The footwear choice here is pretty easy: complete this outfit with old west ultra flex broad square toe boot youth.